Summertime in New Orleans I like recipes that require minimal cooking. The less need to heat up the kitchen the better. This recipe came together as a 4th of July dish that was hearty enough for me to have has the main part of my meal while the others had grilled salmon. Unlike most grains, quinoa is considered a “complete” protein, meaning that it contains all nine essential amino acids. These are the smaller components of protein that we need to get from our diet, because our body doesn’t manufacture them. I was thinking of cous-cous salads that I used to sample when I lived in the South of France. The cous-cous would be “cooked” only in lemon juice, the acid of the lemons cook the grain without water. Quinoa does require cooking, however, I added lots of lemon to the dressing to give it that tangy flavor. Note that almonds can also be roasted at 300 Farenheit oven for 10 minutes or so. I prefer not to use the oven, and it is easy to watch the almonds for over-cooking on the stovetop. I use a rice cooker to cook quinoa. Cooking it on the stovetop is very easy too. This is a large quantity of quinoa salad. Feel free to half the recipe. We had enough for 4th of July lunch and leftovers for a day or two. For leftover lunch I paired it with leftover hummus (recipe here) and steamed broccoli and kale. I also had leftover dressing which was perfect for dipping artichoke leaves and would be great on a simple green salad. To cook the quinoa: On the stovetop, place 2 3/4 cups water in a medium sized pot, add quinoa and bring to a boil. Reduce heat to a simmer, and cook until all of the visible water has evaporated, turn off heat and cover. If using a rice cooker, use 2 3/4 cup water and quinoa, turn on rice cooker. 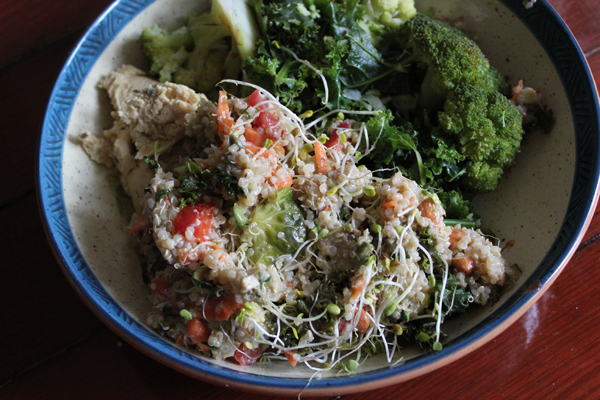 When the quinoa is cooked, mix the raw kale into the quinoa, keeping the quinoa in the rice cooker or pot. Cover and let sit for 5 minutes. Grate zucchini, peel and grate carrots, chop tomatoes into bite sized chunks. Chop the avocado into small chunks. Heat a medium sized skillet to medium heat setting, place the almonds on the skillet. Sprinkle with Braggs, Soy or Tamari and stir gently. Cook until slightly fragrant. Remove from heat and let cool. When cooled, chop the almonds finely. 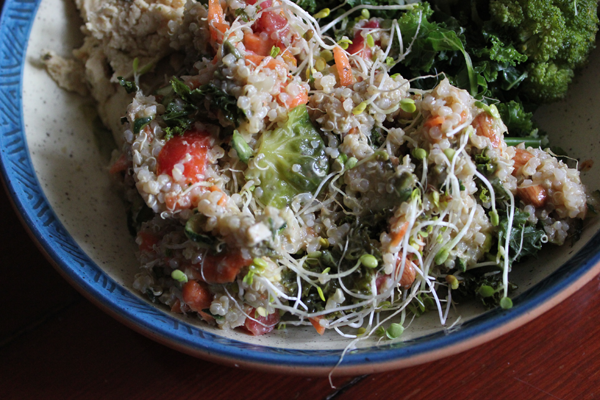 Mix all ingredients together in a large bowl – quinoa + kale, zucchini, carrots, tomatoes, avocado and chopped almonds. Top with 1/2 cup of the dressing below. You may want more dressing depending on your preferences. Mix all dressing ingredients together and serve with quinoa salad. There are endless variations of this salad. Do you have a favorite way of preparing quinoa?